Ombre nails is currently the hot new trend. I actually did this nail art many months ago in December here, not knowing that this would be called ombre. I decided to do a tutorial on how I created my look. The rose paper flower tutorial is here. To create this look you will need three different shades of a color from lightest to dark, I used pinks and white. The first step is to polish with a Finger Paints Base Coat and then LA Colors 561 white nail polish all over my nails as the second base color. The white nail polish must be tacky for the blending to work. With a makeup sponge put the lightest color, Essie Fiji, and dab the color all over the nail. 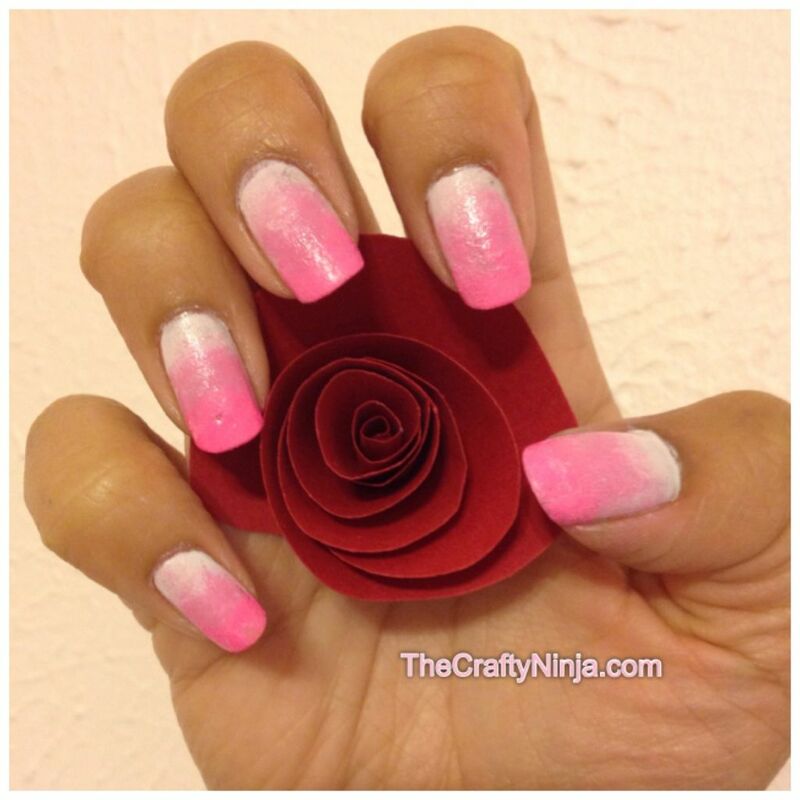 Then on another side of the makeup sponge with the medium pink, Revlon Cupid, start 3/4 of the nail and dab to the tip. Again on another side of the sponge, with the darkest pink, China Glaze Shocking Pink, only dab the sponge on the tip. Once the nails were almost dry I went over the areas where the two colors meet and blended it with the makeup sponge with the lightest color. Here is a detailed picture on how I made my ombre nails. 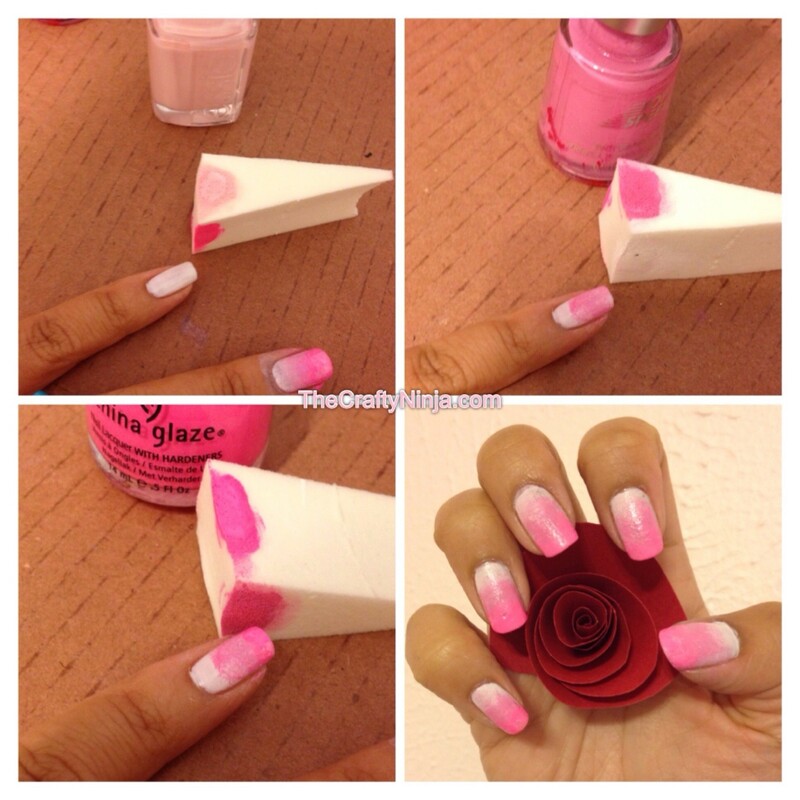 Add a clear Finger Paints Top Coat and it will blend the layers even more.